At 6,035 feet (1,839 m) the city stands over 1 mile (1.6 km) above sea level, though some areas of the city are significantly higher and lower. Colorado Springs is situated near the base of Pikes Peak, which rises 14,115 feet (4,302 m) above sea level on the eastern edge of the Southern Rocky Mountains. The city is home to 24 national governing bodies of sport, including the United States Olympic Committee, the United States Olympic Training Center, and USA Hockey. The city had an estimated population of 465,101 in 2016, and a metro population of approximately 712,000, ranking as the second most populous city in the state of Colorado, behind Denver, and the 42nd most populous city in the United States. The Colorado Springs, CO Metropolitan Statistical Area had an estimated population of 712,327 in 2016. The city is included in the Front Range Urban Corridor, an oblong region of urban population along the Front Range of the Rocky Mountains in Colorado and Wyoming, generally following the path of Interstate 25 in both states. 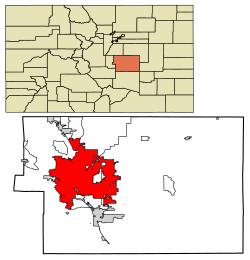 The city covers 194.9 square miles (505 km2), making it the most extensive municipality in Colorado. In 2018, Colorado Springs received several accolades: U.S. News named Colorado Springs the number one most desirable place to live in the United States, and number two on their list of the 125 Best Places to Live in the USA. The Metropolitan Policy Program at Brookings found that Colorado Springs was the fastest growing city for Millennials. Thumbtack's annual Small Business Friendliness Survey found Colorado Springs to be the number four most business friendly city in the country. 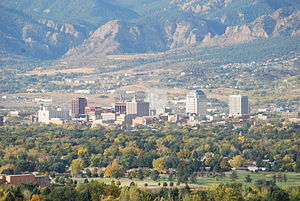 The Ute, Arapaho and Cheyenne peoples were the first recorded inhabiting the area which would become Colorado Springs. Part of the territory included in the United States' 1803 Louisiana Purchase, the current city area was designated part of the 1854 Kansas Territory. In 1859, after the first local settlement was established, it became part of the Jefferson Territory on October 24 and of El Paso County on November 28. Colorado City at the Front Range confluence of Fountain and Camp creeks was "formally organized on August 13, 1859" during the Pike's Peak Gold Rush. It served as the capital of the Colorado Territory from November 5, 1861, until August 14, 1862, when the capital was moved to Denver. From 1899 to 1901 Tesla Experimental Station operated on Knob Hill, and aircraft flights to the Broadmoor's neighboring fields began in 1919. Alexander Airport north of the city opened in 1925, and in 1927 the original Colorado Springs Municipal Airport land was purchased east of the city. In World War II the United States Army Air Forces leased land adjacent to the municipal airfield, naming it "Peterson Field" in December 1942. This was only one of several military presences in and around Colorado Springs during the war. In November 1950, Ent Air Force Base was selected as the Cold War headquarters for Air Defense Command (ADC). The former WWII Army Air Base, Peterson Field, which had been inactivated at the end of the war, was re-opened in 1951 as a U.S. Air Force base. The 1950s through 1970s saw a continued expansion of the military presence in the area, with the establishment of NORAD's headquarters in the city, as well as the ADCOM headquarters. Between 1965 and 1968, the University of Colorado Colorado Springs, Pikes Peak Community College and Colorado Technical University were established in or near the city. In 1977 most of the former Ent AFB became a US Olympic training center. The Libertarian Party was founded within the city in the 1970s. 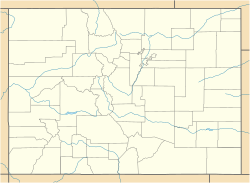 The city lies in a high desert with the Southern Rocky Mountains to the west, the Palmer Divide to the north, high plains further east, and high desert lands to the south when leaving Fountain and approaching Pueblo. 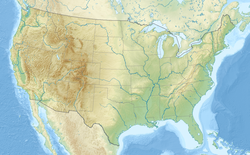 According to the United States Census Bureau, the city has a total area of 194.6 square miles (504.1 km2), of which 194.6 square miles (503.9 km2) is land and 0.35 square miles (0.9 km2), or 0.19%, is water. Colorado Springs has many features of a modern urban area, such as parks, bike trails, and urban open-area spaces. However, it is not exempt from problems that typically plague cities that experience tremendous growth, such as overcrowded roads and highways, crime, sprawl, and government budget issues. Many of the problems are indirectly or directly caused by the city's difficulty in coping with the large population growth experienced in the last twenty years, and the annexation of the Banning Lewis Ranch area to accommodate further population growth of 175,000 future residents. Colorado Springs has a cooler, dry-winter semi-arid climate (Köppen BSkw), and its location just east of the Rocky Mountains affords it the rapid warming influence from chinook winds during winter but also subjects it to drastic day-to-day variability in weather conditions. The city has abundant sunshine year-round, averaging 243 sunny days per year, and receives approximately 16.5 inches (419 mm) of annual precipitation. Due to unusually low precipitation for several years after flooding in 1999, Colorado Springs enacted lawn water restrictions in 2002. These were lifted in 2005. Colorado Springs is one of the most active lightning strike areas in the United States. 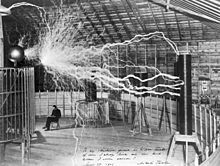 This natural phenomenon led Nikola Tesla to select Colorado Springs as the preferred location to build his lab and study electricity. Winters range from mild to moderately cold, with December, the coldest month, averaging 30.8 °F (−0.7 °C); historically January has been the coldest month, but, in recent years, December has had both lower daily maxima and minima. Typically, there are 5.2 nights with sub-0 °F (−18 °C) lows and 23.6 days where the high does not rise above freezing, and extended sub-zero (°F) cold snaps are possible but infrequent. Snowfall is usually moderate and remains on the ground briefly because of direct sun, with the city receiving 38 inches (97 cm) per season, although the mountains to the west often receive in excess of triple that amount; March is the snowiest month in the region, both by total accumulation and number of days with measurable snowfall. In addition, 8 of the top 10 heaviest 24-hour snowfalls have occurred from March to May. Summers are warm, with July, the warmest month, averaging 70.9 °F (21.6 °C), and 18 days of 90 °F (32 °C)+ highs annually. Due to the high elevation and aridity, nights are usually relatively cool and rarely does the low remain above 70 °F (21 °C). Dry weather generally prevails, but brief afternoon thunderstorms are common, especially in July and August when the city receives the majority of its annual rainfall, due to the North American Monsoon. The first autumn freeze and the last freeze in the spring, on average, occur on October 2 and May 6, respectively; the average window for measurable snowfall (≥0.1 in or 0.25 cm) is October 21 through April 25. Extreme temperatures range from 101 °F (38 °C) on June 26, 2012 and most recently on June 21, 2016, down to −27 °F (−33 °C) on February 1, 1951 and December 9, 1919. As of the 2010 census, the population of Colorado Springs was 416,427 (40th most populous U.S. city), and the population of the Colorado Springs Metropolitan Statistical Area was 645,613 in 2010 (84th most populous MSA), and the population of the Front Range Urban Corridor in Colorado was an estimated 4,166,855. As of the April 2010 census: 78.8% White, 16.1% Hispanic or Latino (of any race), 6.3% Black or African American, 3.0% Asian, 1.0% Native American, 0.3% Native Hawaiian and Other Pacific Islander, 5.5% Some other race, 5.1% Two or more races. Mexican Americans made up 14.6% of the city's population. The median age in the city was 35 years. [nb 1] Non-Hispanic Whites were 70.7% of the population, compared to 86.6% in 1970. Colorado Springs' economy is driven primarily by the military, the high-tech industry, and tourism, in that order. The city is currently experiencing some growth mainly in the service sectors. The unemployment rate for the city as of October 2015 was 3.9%, a decrease from 4.8% in October 2014 and 7.3% in November 2013 and compared to 3.8% for the state and 5.0% for the nation. The defense industry is a significant part of the Colorado Springs economy, with some of the city's largest employers coming from the sector. A large segment of this industry is dedicated to the development and operation of various projects for missile defense. With its close ties to defense, the aerospace industry has also influenced the Colorado Springs economy. Although some defense corporations have left or downsized city campuses, a slight growth has been recorded. Significant defense corporations in the city include Northrop Grumman, Boeing, General Dynamics, Harris Corporation, SAIC, ITT, L-3 Communications, Lockheed Martin . The Space Foundation is based in Colorado Springs. A large percentage of Colorado Springs' economy is based on manufacturing high tech and complex electronic equipment. The high tech sector in the Colorado Springs area has decreased its overall presence from 2000 to 2006 (from around 21,000 down to around 8,000), with notable reductions in information technology and complex electronic equipment. Due to a slowing in tourism, the high tech sector still remains second to the military in terms of total revenue generated and employment. Current trends project the high tech employment ratio will continue to decrease in the near future. Verizon Business, a telecommunications firm, had nearly 1300 employees in 2008. Hewlett-Packard has a large sales, support, and SAN storage engineering center for the computer industry. Storage Networking Industry Association is the home of the SNIA Technology Center. Agilent, spun off from HP in 1999 as an independent, publicly traded company. Intel had 250 employees in 2009. The facility is now used for the centralized unemployment and social services complex. Microchip Technology (formerly Atmel), is a chip fabrication organization. Cypress Semiconductor Colorado Design Center is a chip fabrication research and development site. The Apple Inc. facility was sold to Sanmina-SCI in 1996. Almost immediately following the arrival of railroads beginning in 1871, the city's location at the base of Pikes Peak and the Rocky Mountains made it a popular tourism destination. Tourism is the third largest employer in the Pikes Peak region, accounting for more than 16,000 jobs. Nearly 5 million visitors come to the area annually, contributing $1.35 billion in revenue. Colorado Springs has more than 55 attractions and activities in the area, including Garden of the Gods, United States Air Force Academy, the ANA Money Museum, Cheyenne Mountain Zoo, Colorado Springs Fine Arts Center, Old Colorado City and the U.S. Olympic Training Center. The downtown Colorado Springs Visitor Information Center offers free area information to leisure and business travelers. The Cultural Office of the Pikes Peak Region (COPPeR), also located downtown, supports and advocates for the arts throughout the Pikes Peak Region. It operates the PeakRadar website to communicate city events. Colorado Springs is home to the annual Colorado Balloon Classic, a hot air balloon festival that takes place over Labor Day weekend at the City's Memorial Park. Other annual events include a comic book convention and science fiction convention called GalaxyFest in February,  a pride parade called PrideFest in July,  the Greek Festival, the Pikes Peak Ascent and Marathon, and the Steers & Beers Whiskey and Beer Festival in August, and the Emma Crawford Coffin Races and Festival in nearby Manitou Springs and Arts Month in October. The Colorado Springs Festival of Lights is held every December. The Festival includes the Festival of Lights Parade which runs along Tejon Street in Downtown Colorado Springs. Although Colorado voters approved Colorado Amendment 64, a constitutional amendment in 2013 legalizing retail sales of marijuana for recreational purposes, the Colorado Springs city council voted not to permit retail shops in the city, as was allowed in the amendment. Medical marijuana outlets continue to operate in Colorado Springs. As of 2015, there were 91 medical marijuana clinics in the city, which reported sales of $59.6 million in 2014, up 11 percent from the previous year but without recreational marijuana shops. On April 26, 2016 Colorado Springs city council decided to extend the current six-month moratorium to eighteen months with no new licenses to be granted until May 2017. On July 27, 2017 the Cannabist published an article with a link to a scholarly paper where the author suggest the city will give up 25.4 million dollars in tax revenue and fees if the city continues to thwart the industry from opening within the city limits. On March 1, 2018 there were 131 medical marijuana centers and no recreational cannabis stores. Colorado Springs has been the subject of or setting for many books, movies and television shows, and is a frequent backdrop for political thrillers and military-themed stories because of its many military installations and vital importance to the United States' continental defense. Notable television series using the city as a setting include Dr. Quinn, Medicine Woman and the Stargate series Stargate SG-1, as well as the films WarGames and The Prestige. In a North Korean propaganda video released in April 2013, Colorado Springs was inexplicably singled out as one of four targets for a missile strike. The video failed to pinpoint Colorado Springs on the map, instead showing a spot somewhere in Louisiana. Colorado Springs, dubbed Olympic City USA, is home to the United States Olympic Training Center and the headquarters of the United States Olympic Committee and the United States Anti-Doping Agency. 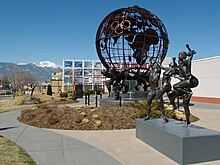 In addition, 24 of the United States' national federations for individual Olympic sports have their headquarters in Colorado Springs, including: US bobsled, fencing, figure skating, basketball, boxing, cycling, judo, field hockey, hockey, swimming, shooting, table tennis, taekwondo, triathlon, volleyball, pentathlon, handball, and wrestling associations and organizations. Further, over 50 national sports organizations (non-Olympic) headquarter in Colorado Springs. These include the National Strength and Conditioning Association, Sports Incubator, a various non-Olympic Sports (such as USA Ultimate), and more. The city has a long association with the sport of figure skating, having hosted the U.S. Figure Skating Championships six times and the World Figure Skating Championships five times. It is home to the World Figure Skating Museum and Hall of Fame and the Broadmoor Skating Club, a notable training center for the sport. In recent years, the World Arena has hosted skating events such as Skate America and the Four Continents Figure Skating Championships. The Pikes Peak International Hill Climb (PPIHC), also known as The Race to the Clouds, is an annual invitational automobile and motorcycle hill climb to the summit of Pikes Peak, every year on the last Sunday of June. The highway wasn't completely paved until 2011. The local colleges feature many sports teams. Notable among them are the following nationally competitive NCAA Division I teams: United States Air Force Academy (Falcons) Football, Basketball and Hockey, Colorado College (Tigers) Hockey, and Women's Soccer. Colorado Springs also boasts three top-ranked Division III collegiate ultimate programs: Air Force Afterburn (Open), Colorado College Wasabi (Open), and Colorado College Strata (Women's). The Mountain West Conference and the National Collegiate Hockey Conference is based in Colorado Springs. 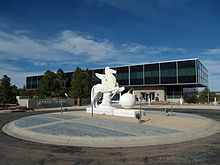 Colorado Springs is home to the Pro Rodeo Hall of Fame and the headquarters of the Professional Rodeo Cowboys Association. Colorado Springs was the original headquarters of the Professional Bull Riders (PBR) from its founding in 1992 until 2005, when the organization was moved to Pueblo. There are 136 neighborhood, 8 community, 7 regional parks and 5 sports complexes totaling 9,000 acres managed by the city's Parks, Recreation and Cultural Services. They also manage 500 acres of trails, which are 160 miles of park trails and 105 miles of urban trails. There are 5,000 acres of open spaces in 48 open space areas. Garden of the Gods, on the western edge of Colorado Springs, has been described as the most beautiful park in the world. It is a National Natural Landmark with 300-foot sandstone rock formations often viewed against a backdrop of the snow-capped mountains of Pikes Peak. The park offers a variety of annual events, one of the most popular of which is the Starlight Spectacular; a recreational bike ride held every summer to benefit the Trails and Open Space Coalition of Colorado Springs. Colorado Springs has several major parks, such as Palmer Park, America the Beautiful Park (Confluence Park), Memorial Park, and Monument Valley Park. Monument Valley Park is the location of Tahama Spring, the original spring in Colorado Springs. The Austin Bluffs Park also affords a place of recreation in eastern Colorado Springs. Ponderosa pine (Pinus ponderosa), Gambel oak (Quercus gambelii), narrowleaf yucca (Yucca angustissima, syn. Yucca glauca) and prickly pear cactus (Opuntia macrorhiza) are some of the more common flora endemic to the Front Range in Colorado Springs. Ackerman Overlook near United States Air Force Academy off Interstate 25 in Colorado Springs is named for Jasper D. Ackerman (1896–1988), a banker and rancher. Three trails, the New Santa Fe Regional Trail, Pikes Peak Greenway and Fountain Creek Regional Trail, form a continuous path from Palmer Lake, through Colorado Springs, to Fountain, Colorado. The majority of the trail between Palmer Lake and Fountain is a soft surface breeze gravel trail. A major segment of the trail within the Colorado Springs city limits is paved. The Urban Trail system within Colorado Springs consists of more than 110 miles of multi-use trail for biking, jogging, roller blading and walking. The trails, except Monument Valley Park trails, may be used for equestrian traffic. Motorized vehicles are not allowed on the trails. Many of the trails are interconnected, having main "spine" trails, like the Pikes Peak Greenway, that lead to secondary trails. On November 2, 2010, Colorado Springs voters adopted a council-strong mayor form of government. The City of Colorado Springs transitioned to the new system of government in 2011. Under the council-strong mayor system of government, the mayor is the chief executive and the city council is the legislative branch. The mayor is a full-time elected position and not a member of the city council. The city council has nine members total, six of which represent one of six equally populated districts each. The remaining three members are elected "at-large". The mayor has veto authority, with the city council having the ability to override a mayoral veto by a two-thirds majority vote (6 out of 9). Colorado Springs City Hall was built from 1902 to 1904 on land donated by W. S. Stratton. Colorado School for the Deaf and Blind. Cheyenne Mountain Charter Academy, CIVA Charter School and The Classical Academy are charter schools. The University School of Colorado Springs. Colorado School for the Deaf and Blind is a residential school. The United States Air Force Academy is a military school for officer candidates. IntelliTec College is a technical training school. Pikes Peak Community College offers a two-year degree program. In March 2016 there were six newspapers actively publishing in Colorado Springs including the newspaper with the largest circulation in the state. Colorado-Pueblo MSA is the 90th largest broadcast market in the US. There are 24 digital television stations in Colorado Springs and 34 radio stations. Colorado Springs is primarily served by two interstate highways. I-25 runs north and south through Colorado, and traverses the city for nearly 18 miles (29 km), entering the city south of Circle Drive and exiting north of North Gate Blvd. In El Paso County it is known as Ronald Reagan Highway. [nb 3] US 24 runs across the central mountains, through the city, and onto the plains. From west to east in Colorado Springs, US 24 follows the western portion of Cimarron Street and the Midland Expressway, a 2-mile concurrent section with I-25/US 87 between exits 139 and 141, part of Fountain Blvd, an expressway called the Martin Luther King Bypass, part of South Powers Blvd (where it is concurrent with Colorado 21), and the easternmost portion of Platte Avenue out of the city. In November 2015, voters in Colorado Springs overwhelmingly passed ballot measure 2C, dedicating funds from a temporary sales tax increase to much needed road and infrastructure improvements over five years. This temporary increase is estimated to bring in approximately $50M annually, which will be used solely to improve roads and infrastructure. The Ballot measure passed by a margin of approximately 65–35%, and was championed by newly elected Mayor John Suthers. In 2004, the voters of Colorado Springs and El Paso County established the Pikes Peak Rural Transportation Authority and adopted a 1% sales tax dedicated to improving the region's transportation infrastructure. Together with state funding for the Colorado Springs Metro Interstate Expansion (COSMIX) (2007 completion) and the I-25 interchange with Highway 16 (2008 completion), significant progress has been made since 2003 in addressing the transportation needs of the area. Colorado Springs Airport (COS), six miles to the southeast, is the second-largest commercial airport in the state. Peterson Air Force Base is a tenant of the airport. Freight service is provided by Union Pacific and BNSF. Currently there is no intercity passenger service. The city last had passenger service in 1967 with the Denver to Dallas Texas Zephyr run by the Colorado & Southern Railway and the Fort Worth & Denver Railway (both subsidiaries of the Burlington Route). A 2011 study by Walk Score ranked Colorado Springs 34th most walkable of fifty largest U.S. cities. A Metro bus drives past a parking garage in downtown Colorado Springs. Mountain Metropolitan Transit (MMT) offers public transportation services in the Pikes Peak region providing over 11,000 one-way trips per day. In addition to bus routes within the City of Colorado Springs, Mountain Metro Transit provides service into Manitou Springs, north to the Chapel Hills Mall, east to Peterson Air Force Base and south into the Widefield area. Mountain Metro Mobility is an Americans with Disabilities Act (ADA) federally mandated complementary ADA paratransit service, which provides demand-response service for individuals with mobility needs that prevent them from using the fixed-route bus system. Bishkek mayor Arstanbek Nogoev presents a gift for Colorado Springs mayor Lionel Rivera to a US airman at Manas Air Base, in a ceremony aimed at reviving ties between the two sister cities. Colorado Springs' sister city organization began when Colorado Springs became partners with Fujiyoshida. The torii gate erected to commemorate the relationship stands at the corner of Bijou Street and Nevada Avenue, and is one of the city's most recognizable landmarks. The torii gate, crisscrossed bridge and shrine, located in the median between Platte and Bijou Streets in downtown Colorado Springs, were a gift to Colorado Springs, erected in 1966 by the Rotary Club of Colorado Springs to celebrate the friendship between the two communities. A plaque near the torii gate states that "the purpose of the sister city relationship is to promote understanding between the people of our two countries and cities". The Fujiyoshida Student exchange program has become an annual event. To strengthen relations between the two cities, the Colorado Springs Youth Symphony regularly invites the Taiko drummers from the city to participate in a joint concert in the Pikes Peak Center. The orchestra played in Bankstown, Australia, in 2002 and again in June 2006 as part of their tours to Australia and New Zealand. Also, in 2006 and 2010, the Bankstown TAP (Talent Advancement Program), performed with the Youth Symphony, and the Colorado Springs Children's Chorale, as a part of the annual "In Harmony" program. A notable similarity between Colorado Springs and its sister cities are their geographic positions: three of the seven cities are also located near the base of a major mountain or mountain range. ^ As of the census of 2000 (limited only to the city limits and not including the very diverse Fort Carson area which many view as being a part of the Colorado Springs metropolitan area), there were 360,890 people, 141,516 households, and 93,117 families residing in the city. The population density was 1,942.9 people per square mile (750.2/km²). There were 148,690 housing units at an average density of 800.5 per square mile (309.1/km²). The racial makeup of the city was 80.7% White, 6.6% African American, 0.9% Native American, 2.8% Asian, 0.2% Pacific Islander, 5.0% from other races, and 3.9% from two or more races. 12.0% of the population were Hispanic or Latino of any race. There were 141,516 households out of which 34.0% had children under the age of 18 living with them, 51.5% were married couples living together, 10.6% had a female householder with no husband present, and 34.2% were non-families. 27.0% of all households were made up of individuals and 6.9% had someone living alone who was 65 years of age or older. The average household size was 2.50 and the average family size was 3.06. In the city, the population was spread out with 26.5% under the age of 18, 10.3% from 18 to 24, 32.8% from 25 to 44, 20.8% from 45 to 64, and 9.6% who were 65 years of age or older. The median age was 34 years. For every 100 females, there were 97.8 males. For every 100 females age 18 and over, there were 95.2 males. (Note: City statistics do not include the demographic influence of five local military bases). The median income for a household in the city was $45,081, and the median income for a family was $53,478. Males had a median income of $36,786 versus $26,427 for females. The per capita income for the city was $22,496. About 6.1% of families and 8.7% of the population were below the poverty line, including 10.8% of those under age 18 and 7.2% of those age 65 or over. ^ This nullifies a popular Canadian claim that the 2008 IIHF World Championships in Quebec City and Halifax marked the first time this event was organized on the American continent. However, the 2008 event was the first World Championship on the American continent in which NHL players were eligible to compete. ^ In order to combat congestion the Colorado Department of Transportation widened the Interstate 25 corridor throughout the city from four lanes (two in each direction) to six lanes in a program called COSMIX. Ultimately, the plan is to make the interstate eight lanes through the city when funding becomes available. This plan is similar in nature to Denver's T-Rex expansion plan. Work has been completed to expand Interstate 25 from 4 to 6 lanes between Woodmen Road (exit 149, the northern terminus for the COSMIX project) and Monument (exit 161). ^ In addition, there were plans to develop a "Front Range Toll Road", a privately owned turnpike, which would begin south of Pueblo and end around Fort Collins. This toll road would allow rail and truck traffic to avoid the more highly traveled parts of I-25 along the Front Range. Initially, the project had support but has since been highly contested because of the need to condemn the land of many private citizens, through the use of eminent domain, to make room for the corridor. ^ The project developers also have hopes of increasing business at the future I-25 Powers Boulevard connection by building a 2.8 million sq. ft. shopping mall on the East side of the Powers exit. Developers hope to have the project finished by 2013, but have a deadline of 2018. ^ "Olympic City USA". City of Colorado Springs. Retrieved June 1, 2017. ^ "Summer in the Springs". City of Colorado Springs. Retrieved June 1, 2017. ^ "Best of the Springs". The Gazette. Colorado Springs. January 29, 2016. Retrieved June 1, 2017. ^ "Archived copy". Archived from the original on August 15, 2014. Retrieved October 28, 2014. CS1 maint: Archived copy as title (link) United States Census Bureau. Retrieved May 28, 2014. ^ "What is Colorado Springs' population". July 18, 2009. ^ "Fact Finder Census Gov". Fact Finder. Archived from the original on April 17, 2016. Retrieved February 10, 2016. ^ "The 25 Most Desirable Places to Live in the U.S. in 2018". U.S. News. Retrieved February 7, 2019. ^ "125 Best Places to Live in the USA". U.S. News. Retrieved February 7, 2019. ^ "The Millennial Generation: A demographic bridge to America's diverse future" (PDF). Brookings.edu. Retrieved February 7, 2019. ^ "2018 Small Business Friendliness Survey". Thumbtack. Retrieved February 7, 2019. 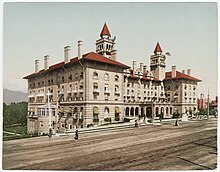 ^ "Colorado Springs History and Heritage". Visit Colorado Springs. Retrieved May 24, 2013. ^ "El Paso County". History Colorado. Archived from the original on December 4, 2013. Platted by his Colorado Springs Company in 1876 [sic] Manitou Springs retains its winding roads, spa, and many of its grand hotels and residences. Of the approximately 1001 buildings, 752 are considered to be contributing... Miramount Castle...housed a sanitarium operated by the Sisters of Mercy. CS1 maint: BOT: original-url status unknown (link) (in 1916, the Sisters of Mercy operated the Montcalm Sanitorium). ^ Harrison, Deborah (2012). Manitou Springs. Arcadia Publishing. Retrieved February 27, 2014. ^ "Downtown Historic Survey". City of Colorado Springs. Retrieved February 27, 2014. ^ Capace, Nancy (March 1, 1999). Encyclopedia of Colorado (Google books). North American Book Dist LLC. p. 173. ISBN 978-0-403-09813-2. Retrieved May 23, 2013. ^ "Colorado's Mining Craze" (PDF). The New York Times. December 2, 1895. Retrieved November 12, 2013. ^ a b Hartman, James Edward (June 28, 1996). Original Colorado Springs Municipal Airport (NRHP Inventory—Nomination Form). Contributing 4…Non-contributing 1 … Nichols Field and the Pine Valley Air Strip were located on north Nevada Avenue. … In 1942 the hangar was purchased by the City of Colorado Springs. The Air Force began leasing the [Broadmoor] hangar as a storage area in 1958. … 1951 • Facility usage is re-leased to the Military (383 acres) for the 4600 Air Base Group (Jan.). … 1966…The City of Colorado Springs renegotiates with Air Force total of 992 acres (until June 30, 2066). ^ Mueller, Robert (1989). "Active Air Force Bases Within the United States of America on 17 September 1982". Air Force Bases (Report). Office of Air Force History. I. ISBN 0-912799-53-6. ^ Hellmann, Paul T (November 1, 2004). Historical Gazetteer of the United States (Google books). Taylor & Francis. p. 129. ISBN 978-0-203-99700-0. Retrieved May 23, 2013. ^ Annual Report to Congress of the Federal Board for Vocational Education (Report). Retrieved November 29, 2013. ^ Sydney Herdle – The Daily Collegian. "A guide to the major platforms of the Libertarian Party". psu.edu. ^ a b "City of Colorado Springs – Drought". November 3, 2010. ^ "Geographic Identifiers: 2010 Demographic Profile Data (G001): Colorado Springs city, Colorado". American Factfinder. U.S. Census Bureau. Retrieved January 25, 2016. ^ "Another strange twist in Banning Lewis Ranch bankruptcy". Colorado Springs Gazette. Retrieved February 27, 2017. ^ "Colorado Springs, Colorado Climate". BestPlaces. Retrieved October 28, 2015. ^ "Colorado sunshine is more myth than science". The Denver Post. January 3, 2012. Retrieved October 28, 2015. ^ "Tesla, Life and Legacy". pbs.org. Retrieved April 10, 2014. ^ "Colorado Springs". Climate-zone.com. Retrieved September 15, 2010. ^ a b c d "NowData – NOAA Online Weather Data". National Oceanic and Atmospheric Administration. Retrieved March 13, 2019. ^ "Evolution of the North American Monsoon". DRI Desert Research Institute. Retrieved February 27, 2017. ^ climateSpy.com. "Colorado Springs, CO climate in February". climatespy.com. Archived from the original on February 27, 2017. Retrieved February 27, 2017. ^ "Station Name: CO COLORADO SPRINGS MUNI AP". National Oceanic and Atmospheric Administration. Retrieved March 13, 2019. ^ "SAS Output". Mcdc.missouri.edu. Archived from the original on July 11, 2012. Retrieved October 23, 2011. ^ "Estimates of Population Change for Metropolitan Statistical Areas and Rankings: July 1, 2007 to 1 July 2008". Census.gov. Archived from the original on June 10, 2010. Retrieved October 5, 2009. ^ "Detailed tables". U.S. Census Bureau. Retrieved September 15, 2010. ^ "Colorado Springs (city), Colorado". State & County QuickFacts. U.S. Census Bureau. Archived from the original on June 14, 2012. ^ "Bureau of Labor Statistics website". Bureau of Labor Statistics. Retrieved February 16, 2016. ^ "Colorado Department of Labor and Employment". Colorado, the official web portal. Retrieved February 16, 2016. ^ geosolinc.com. "U.S. Bureau of Labor Statistics". U.S. Gov. Retrieved February 16, 2016. ^ Gazette, Colorado Springs. "Boeing adds jobs in Colorado Springs – The Denver Post". Retrieved February 27, 2017. ^ "General Dynamics subsidiary shutters 60-person office in Colorado Springs". Colorado Springs Gazette. Retrieved February 27, 2017. ^ "Harris Corp. helping small Colorado Springs defense contractor grow into bigger role". Colorado Springs Gazette. Retrieved February 27, 2017. ^ "2006–2007 Southern Colorado Economic Forum Publication". p. 18. Archived from the original on May 14, 2008. Retrieved September 15, 2010. ^ "A barren Garden of the Gods". EETimes.com. Retrieved October 5, 2009. ^ Heilman, Wayne (July 18, 2008). "Colorado jobless rate at its highest since 2005 | percent, rate, colorado". Colorado Springs Gazette. Archived from the original on October 7, 2008. Retrieved October 5, 2009. ^ Heilman, Wayne (August 30, 2008). "Manufacturing, tech jobs slipping away from Springs | manufacturing, springs, technology". Colorado Springs Gazette. Archived from the original on September 7, 2008. Retrieved October 5, 2009. ^ Laden, Rich (June 20, 2008). "HP plans to open centers in Arkansas, New Mexico| springs, colorado, new". Colorado Springs Gazette. Archived from the original on February 17, 2009. Retrieved October 5, 2009. ^ Heilman, Wayne (June 25, 2008). "HP to 800 Springs workers: Move to New Mexico or lose jobs | center, springs, employees". Colorado Springs Gazette. Archived from the original on October 11, 2008. Retrieved October 5, 2009. ^ "SNIA | Advancing Storage and Information Technology". www.snia.org. ^ Heilman, Wayne (July 28, 2008). "1,000 Intel workers will get job-hunting help | intel, help, workers". Colorado Springs Gazette. Archived from the original on August 9, 2008. Retrieved October 5, 2009. ^ "DOLA Planning and Management Region 4 Socioeconomic Profile" (PDF). State Demography Office. ^ a b "Colorado Springs Vacation & Tourism Information – Colorado Springs Colorado". Visitcos.com. Retrieved August 31, 2012. ^ Culture Office of the Pikes Peak Region Overview. Retrieved July 12, 2011. ^ "GalaxyFest". GalaxyFest. Retrieved February 15, 2019. ^ "Colorado Springs PrideFest". Colorado Springs PrideFest. Retrieved February 7, 2019. ^ "Colorado Springs Festival of Lights". The Colorado Springs Festival of Lights. Retrieved February 7, 2019. ^ Ridgeway, James (January 15, 2010). "Day eight Sunday morning in the 'evangelical Vatican'". The Guardian. London. Retrieved April 30, 2010. ^ "Biblica – The International Bible Society". biblica.com. May 13, 2016. ^ "Contact us – Children's Hopechest". hopechest.org. Archived from the original on September 1, 2013. Retrieved August 23, 2013. ^ "Contact Compassion International". compassion.com. ^ "About David C. Cook". Archived from the original on September 7, 2013. Retrieved August 24, 2013. ^ "Development Associates International – Promoting Servant Leadership". DAI. ^ "eMi – Contact Us". emiusa.org. Archived from the original on September 7, 2013. Retrieved August 23, 2013. ^ "Dr. James Dobson's Family Talk". drjamesdobson.org. ^ "How do I contact Focus on the Family?". custhelp.com. Archived from the original on December 9, 2013. Retrieved August 24, 2013. ^ "Hope & Home – Foster Care Colorado Springs". Hope & Home – Foster Care Colorado Springs. ^ "Making Disciples: Using Everything I Have – The Navigators". navigators.org. January 25, 2016. ^ David Song – One Child Matters. "One Child Matters – Page not found". onechildmatters.org. Archived from the original on August 24, 2013. Retrieved August 23, 2013. ^ "Home – Diocese of Colorado Springs". diocs.org. ^ "Products Archive – VisionTrust". VisionTrust. ^ "WAY Media Network Services". WAY Media Network Services. ^ CNN, By Michael Martinez,. "10 things to know about Colorado's recreational marijuana shops – CNN". CNN. ^ "Pot may be legal in Colorado, but it can't be purchased in most large cities" Archived April 10, 2016, at the Wayback Machine, Tacoma News Tribune, March 16, 2016. ^ Op/Ed, The Gazette. "Medical marijuana industry still growing in Colorado Business comparison El Paso County Medical Society policy statement on marijuana use". gazette.com. ^ "Inside a wild week in weed for Colorado Springs". The Cannabist. July 27, 2017. Retrieved March 4, 2018. ^ "The Economic Impact of Allowing Retail Marijuana Establishments in Colorado Springs" (PDF). Daniels School of Business, University of Denver. Miller Chair of Applied Economics – via documentcloud.org. ^ "26 Things People From Colorado Springs Have To Explain To Out-Of-Towners – Movoto". Movoto Real Estate. Retrieved October 14, 2016. ^ "Video: North Korea threatens to strike Colorado Springs but doesn't know where it is". The Washington Post. April 12, 2013. Retrieved May 8, 2013. ^ "Olympic City USA | Colorado Springs". coloradosprings.gov. Retrieved October 14, 2016. ^ "Colorado Springs Sports Industry Competitive Advantages" (PDF). Colorado Springs Business Alliance. Archived from the original (PDF) on September 12, 2015. Retrieved September 6, 2016. ^ "Team USA". Team USA Home. Retrieved February 23, 2016. ^ "Paving completed on Pike's Peak road, 13 years after Sierra Club suit". The Denver Post. September 30, 2011. ^ "City of Colorado Springs Parks Department Unanimously Approves Sand Creek Stadium Renaming to Switchbacks Stadium". March 7, 2016. Archived from the original on May 3, 2016. Retrieved August 20, 2016. ^ "goairforcefalcons.com". goairforcefalcons.com. Air Force Academy Athletics Official Athletic Site – Football. Retrieved October 14, 2016. ^ "Varsity Athletics • Colorado College". coloradocollege.edu. Archived from the original on October 18, 2016. Retrieved October 14, 2016. ^ "Professional Bull Riders – PBR National Headquarters move to Pueblo, Colorado". Professional Bull Riders. Retrieved April 27, 2018. ^ "Parks, Trails and Open Spaces". City of Colorado Springs. Retrieved May 23, 2013. ^ "Best Parks in the World: TripAdvisor List Puts B.C. 's Stanley Park At Number 1". HuffPost. June 17, 2014. ^ "Starlight Spectacular". coloradosprings.gov. May 18, 2017. Archived from the original on January 19, 2018. Retrieved December 22, 2018. ^ "Community Parks". City of Colorado Springs. Retrieved May 22, 2013. ^ "Used Spring 33 Years Ago". Colorado Springs Gazette. December 26, 1904. p. 5. ^ "New Pavilion at Tahama Spring" (PDF). Sunday Gazette and Telegraph. May 16, 1926. Retrieved October 20, 2018. ^ Kaufmann, M. R.; Huckaby, L. S.; Gleason, P., (2000), Ponderosa pine in the Colorado Front Range: long historical fire and tree recruitment intervals and a case for landscape heterogeneity. In: Neuenschwander, Leon F.; Ryan, Kevin C., tech. eds. Proceedings from the Joint Fire Science Conference and Workshop: Crossing the Millennium: Integrating spatial technologies and ecological principles for a new age in fire management; Boise, Idaho, June 15–17, 1999. Moscow, Idaho: University of Idaho: 153–160. ^ USDA (United States Department of Agriculture), Yucca angustissima Engelm. ex Trel. ^ "Trails and hking in Colorado Springs". City of Colorado Springs. Retrieved May 23, 2013. ^ "Pikes Peak Greenway Trail". City of Colorado Springs. Retrieved May 22, 2013. ^ "Pikes Peak Greenway Trail Map, and its submaps". City of Colorado Springs. Archived from the original on January 31, 2013. Retrieved May 22, 2013. ^ "Mayor-Council Form of Government". Archived from the original on December 22, 2015. ^ "1904 – Colorado Springs City Hall – Colorado Springs, CO – Dated Buildings and Cornerstones on". Waymarking.com. December 5, 2009. Retrieved May 8, 2013. ^ "The Colorado Springs School homepage". Retrieved September 15, 2010. ^ "About UCCS – About UCCS – University of Colorado Colorado Springs". uccs.edu. ^ "Remington College | Adopt Our School". Community.remingtoncollege.edu. Retrieved October 23, 2011. ^ Education, Bridgepoint. "History". rockies.edu. ^ "Associate of Science Degree (AS)". apps.ppcc.edu. ^ "Litter Removal Program". Colorado Department of Transportation's (CDOT). Archived from the original on January 14, 2010. Retrieved September 15, 2010. ^ "I-25 North Design Build (Colorado Springs) – CDOT". Coloradodot.info. Retrieved January 19, 2013. ^ Zubeck, Pam (December 29, 2012). "I-25 widening project coming soon | IndyBlog". Csindy.com. Retrieved January 19, 2013. ^ "?". Archived from the original on March 3, 2014. ^ "El Paso County Clerk and Recorder". 2015 Coordinated Election Results. Retrieved February 10, 2016. ^ "PPRTA Homepage". Pprta.com. September 28, 2009. Retrieved October 5, 2009. ^ a b Sealover, Ed (February 3, 2011). "For the love of a road; Colorado Springs Independent, The (Colorado Springs)". csindy.com. Retrieved February 9, 2011. ^ Sealover, Ed (May 13, 2010). "Copper Ridge takes a step; Colorado Springs Independent, The (Colorado Springs) | Find Articles". csindy.com. Retrieved February 9, 2011. ^ "Conheça os Deputados – Portal da Câmara do Deputados (in Portuguese)" (in Portuguese). .camara.gov.br. Retrieved January 19, 2013. ^ "City of Colorado Springs – Topic Pages". Springsgov.com. July 6, 2007. Retrieved October 5, 2009. "Colorado Springs, Colorado". C-SPAN Cities Tour. November 2014. This page was last edited on 18 April 2019, at 05:30 (UTC).